There are many different airports serving the state of California, with the likes of LAX in Los Angeles and San Francisco International Airport in the San Francisco Bay Area being a couple of key examples. San Jose Airport, also known under its full name of Norman Y. Mineta San Jose International Airport, is another example, with this airport serving the city of San Jose, which is the biggest city of Northern California. San Jose Airport is conveniently located just a few miles outside of Downtown San Jose, so it's a perfect option for people wishing to travel in and out of this big city, and it handles around 12 million passengers per year. Flights from San Jose Airport mainly go to destinations around the United States, but there are some flights to places like Mexico, the United Kingdom, China, and Japan as well. If you're flying out of San Jose Airport and have some time to kill before your flight, you might start to feel a little hungry or thirsty as you wait around. Fortunately, the airport is equipped with plenty of high-quality restaurants and casual eateries. Whether you're looking for a light bite, a healthy snack, a simple hamburger, or a full-blown three-course meal, you can find it here. Read on for brief overviews of some of the best restaurants and other places to eat at San Jose Airport. There are two terminals at San Jose Airport, and Terminal A is the older of the two and features 17 gates in total. It also has several good shops, amenities, and eateries to choose from. Here are a few details on the best restaurants in Terminal A. Over by Gates 10 and 11 of Terminal A is where you can find Einstein Bros. Bagels. Most of the time, when waiting at an airport and catching a flight, you don't necessarily want to eat anything too rich or heavy, so most people tend to choose something simple and light like a sandwich, and a bagel is a great alternative. 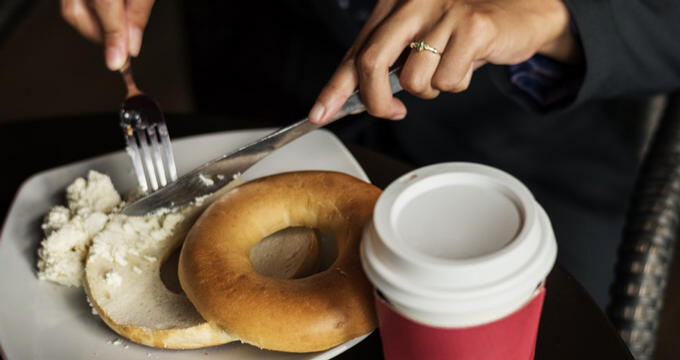 Einstein Bros. Bagels are bagel experts, offering a huge selection of fillings to choose from and the option to fully customize your bagel just the way you like it. Also situated close by to Gate 11 of Terminal A at San Jose Airport is the Gordon Biersch Brewing Company. This place has locations at many major airports around the United States, and they're always very popular. You can find some great craft beers and ales here, as well as wines and spirits too, so it's a nice place to have a pre-flight drink. Those feeling hungry won't be left out, however, as the Gordon Biersch Brewing Company also offers a full menu of great options like burgers and steaks. There are 14 gates at Terminal B of San Jose Airport, numbered 17 through 30. This terminal is more modern than Terminal A, having been opened in 2010. You'll find plenty of comforts and conveniences all around this terminal, and a lot of great restaurants and grab-and-go food spots too. Read on for a few examples. If you've spent much time in the Bay Area or San Jose in general, you should be familiar with Original Joe's. A popular mini-chain with a few locations in San Francisco and San Jose, Original Joe's offers up some delicious Italian and American dishes the whole family can enjoy, and this San Jose Joe's location in Terminal B of San Jose Airport brings those same great flavors to your pre-flight plate. A great place for both a bite and a drink, Flames Eatery & Bar starts off with a huge range of awesome cocktails, with the likes of the Firecracker and Dragon Ball being particularly popular here. You can also order some bottled or draught beers, as well as a fine selection of wines by glass or bottle. As well as all those drinks, Flames provides great food all through the day. The Breakfast Pizza is a fun option for early morning flights, with the various burgers, sandwiches, paninis, pizzas, pastas, and steaks filling out the menu for lunch and dinner later in the day. If you head around to Gate 19 in Terminal B you can quickly and easily spot the Sharks Cage. This is a sports bar dedicated to the San José Sharks, but you don't need to be a fan of the team to enjoy a warm welcome and some fine dining at this place. There's a very homely sort of feel here and the TVs by the bar are ideal for catching up on the latest sports and news. In terms of food, you'll find typical pub and bar fare here like burgers, wings, and sandwiches.